Superstorm Sandy destroyed towns and homes, and took lives, but a stack of 57 letters tied together with a pink ribbon survived the devastating storm. Kathleen Mullen was taking a walk along the Henry Hudson Trail in Atlantic Highlands, N.J., the day after the storm hit when she spotted the bundle of letters. "They were obviously tied with a pink ribbon, so I automatically knew that they were love letters," Mullen told ABC News' New York station WABC-TV. She took them home, carefully dried them under the fireplace in her powerless home and began to read. The letters were written by Dorothy Fallon of Rumson, N.J., and Lynn Farnham of Vermont between 1942 and 1947. "There isn't much more to tell you tonight, dear," one letter read. "I love you very much. Yours always, Dotty." 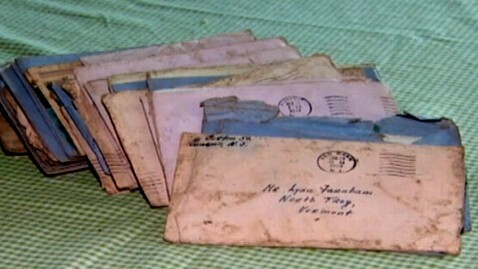 Mullen was determined to reunite the letters with their owners. She posted about the letters on Facebook, Craigslist and eventually did a search on findagrave.com, where a Lynn Farnham was listed who died in 1992 and was buried in New Jersey. Through the website, Mullen connected with Shelly Farnham-Hilber, a niece of the couple, who lives in Virginia. She was thrilled to hear of the find. "It's magical. You go, 'This can't be real,'" Farnham-Hilber told WABC-TV. "It's like a genealogical gold mine. It's just that moment that you think is lost forever and here is something. It's a gift." Farnham-Hilber said that Lynn Farnham, her uncle, served in WWII and was at Pearl Harbor. The couple had two children. The son has died and Farnham-Hilber's family has lost touch with the daughter. Dorothy Farnham is 91 years old and lives in a nursing home in New Jersey. The family is looking forward to being reunited with the letters and the find was a beacon of light to Mullen during tough times. "It kind of sent the message that love conquers all, you know, in such devastation … something so delicate just washes ashore," she said.